Captain Steve Pond approaching Port Kent, N.Y. When my colleague Hannah Palmer Egan told me about North Country Creamery, a dairy farm in Keeseville, N.Y., I couldn’t have been more excited. Popping across the lake for an afternoon and biking three miles to the creamery’s little café seemed like the ideal Seconds of Summer getaway. I invited numerous friends on this little excursion, all of whom had elaborate excuses, such as “I’m working,” or last-minute mishaps such as “I can’t find my cat,” which prevented their participation. So I, the lone traveler, awaited my maiden voyage across Champlain. With my sights set on North Country Creamery and its homemade frozen yogurt, I couldn’t imagine what else was in store for me as I pulled my bike up to King Street Dock and bought my $9 pass to board the ferry. I hadn’t checked the weather that morning. It was a muggy, moist Friday afternoon with clouds sagging into the distant valleys. At 12:15 p.m., the ferry horn (quite loud and closely resembling a bagpipe) sounded us off. There were more crew members than passengers aboard the floating platform, I noted as I climbed to the upstairs cabin. An elderly couple was buying popcorn and Long Trails at a rather dismal-looking snack stand. The walls were sparsely decorated with historical regalia, and I briefly educated myself on the boat’s bio — 85 years back and forth from Burlington to New York State — and the 200-some-year history of Port Kent, the ferry’s destination. Feeling like I needed some wind in my hair, I went outside and caught sight of a large wooden ship wheel and smaller-size captain beside it. I asked if I could take a picture and he waved me into the cabin. An hour later, I had complete working knowledge of the industrial history of Champlain (the ferry) and Champlain (the lake) before and after World War II. 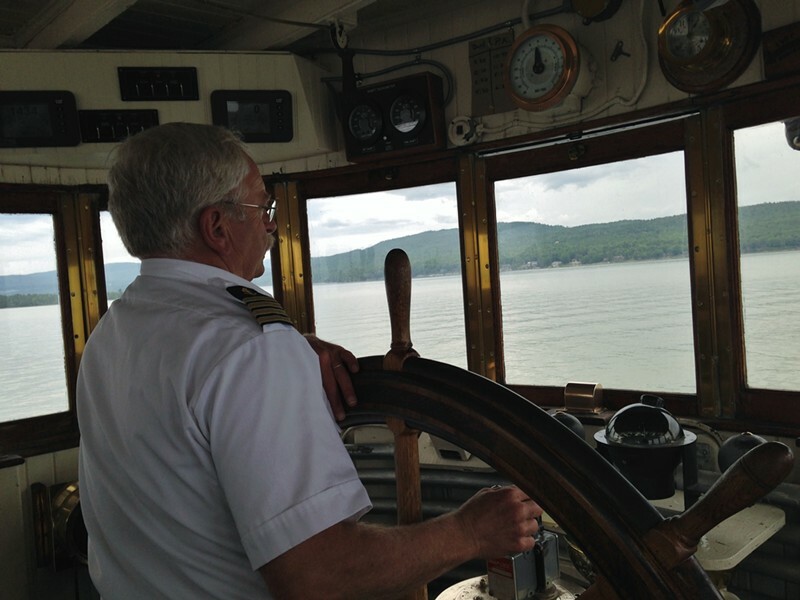 Captain Steven Pond, a ferry pilot of 45 years, a University of Vermont alum and an impromptu history teacher, told me that Port Kent used to be a summer resort town in the 1950s for city folk wanting to escape the heat. Any Champ sightings lately? I asked the captain. “I always tell people that Champ only comes out after a six-pack," he quipped. "We’re not allowed to drink on the job. But I have seen a deer about three miles out.” Who knew deer were such good swimmers? 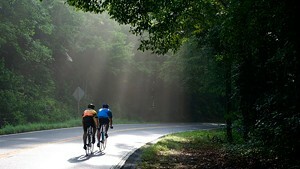 It was a lovely ride, and I fully appreciated the company and the guided tour. We docked at Port Kent about an hour later, at 1:15 pm. I had estimated about 15 minutes for the three-mile bike ride to the farm, but, sizing up the slope that wound into the mountains, I recalculated. It was an uphill battle pretty much the whole way for me and my poorly inflated tires. And it was starting to drizzle. Aside from a couple of cars that whizzed by, I did not see anyone — including in the trailer park or on the small golf course I passed on the right. I did see a young deer on the driving range, though, until it bounded into the woods, snow-white tail flopping awkwardly. I began to think I was lost as the road forked to the left and climbed into yet another hill. Luckily, Captain Pond had forewarned me about this bifurcation and, with somewhat revived determination, I huffed up the final incline and reached a clearing. To my left was a good sign: cows. Another more literal sign in the ground was olive green and welcomed me to Clover Mead Café & Farm Store, the first building on Mace Chasm Road. I was surprised to see a full car lot and an actual person outside eating at a picnic table. I asked her what she got. "Breakfast sandwich," she answered mid-bite. "It's really good." With the woman's thumbs-up approval, I walked into the little store, whose olive décor matched the sign by the road. A young woman welcomed me from behind the counter and asked where I was coming from. I told her I had just biked up from the dock and she chuckled, probably because most of my hair was stuck to my face and I was still out of breath. A second woman was serving a couple at the bar-style counter. They were sitting on some remarkable wooden high chairs made from slabs of polished lumber; some of the bark was still visible. The place was clean and understated and welcoming. I almost forgot I was in the middle of nowhere. After the few customers left, I introduced myself and learned the names of the women who run the café. Marla Gilman, the head cook, and her apprentice, Berlin Krebs, do it all. 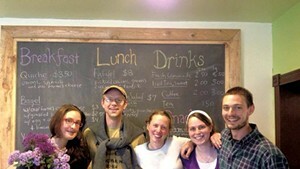 With dairy from the farm, Gilman crafts homemade yogurt and nine types of cheeses. She roasts beef from the farm's cows for the roast beef sandwiches. She makes sauces, pesto, chutneys, bread, baked goods and more from farm-sourced, local ingredients. I couldn't wait to see how those ingredients came together. Sensing I could use a refreshment, Marla offered me a beverage. I pondered the ginger beer from Ausable Brewing Company just down the road, but decided on an Arnold Palmer. After pouring myself a mixture of Clover Mead's homemade iced tea and lemonade from a pair of huge glass coolers in the fridge, I immediately downed half my cup of the chilled, sugary liquid. I was happy to find that the lemonade was sweet rather than a pucker-inducing version. I asked Berlin and Marla for some menu advice. Though they said breakfast fare is a best seller (how did I ever resist the buttermilk pancakes? ), it was well past noon and I was leaning toward lunch. She then recommended the Apple-Camembert Panini. I was glad as hell she did when she presented the sandwich in all its glory, without any sides or sauce distractions on the plate. I wouldn't say that savoring every crunchy, creamy, earthy, crisp, tangy, sweet bite was a religious experience, but it sure came close. 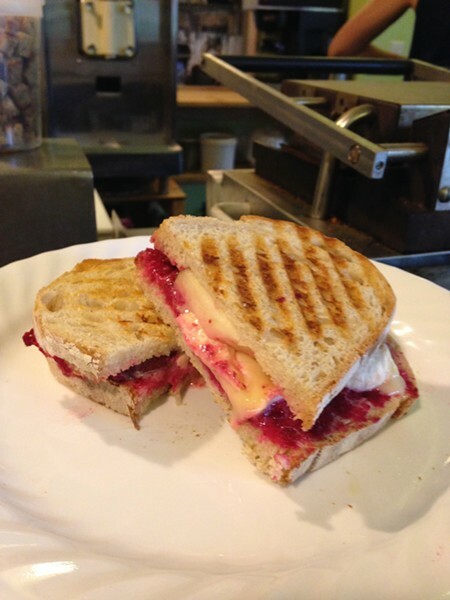 Grilled slices of sourdough encased green apples, rich and oozing Camembert and a bright magenta beet chutney that Marla learned to make in Ireland. It was panini paradise. By this time, sheets of rain were coming down sideways, and I mentally prepared for the ride back down to the ferry dock. I think my two hosts felt badly, because they offered me a ride. I graciously accepted. And that gave me time to taste their new frozen yogurt, which turned out to be more of a sorbet. The homemade yogurt, flavored with maple syrup and organic lemon extract, goes into a soft-serve machine and doles out the icy treat in cones. It had a light, lemony taste that reminded me of Italian ice. There was also an odd, grainy texture to it, a phenomenon that Marla explained is due to the fat separation in non-homogenized yogurt. "It's funny because [the yogurt] has little fat chunks, but half the fat of most frozen yogurt," she said. I wanted to stay and sample the baked good, which included lavender scones and fudgey coffee brownies, but my ferry was scheduled to leave in 10 minutes. Berlin helped me stuff my bike into her car and we sped down the hill through the downpour, reaching the dock with a minute to spare. Do I wish I had gone to Clover Mead on a bright blue, sunny day? Absolutely not. However, if you're looking for a more relaxing experience, I recommend checking the weather, then taking a morning ferry for breakfast or an early lunch. 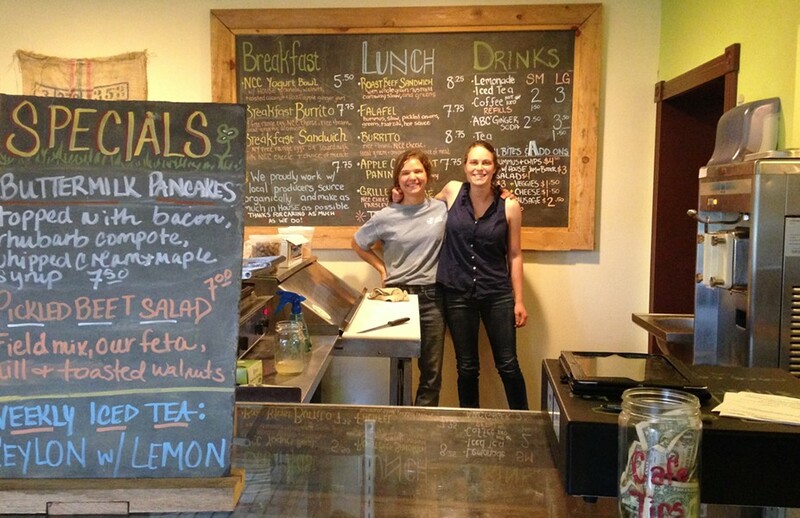 Clover Mead's Café hours are limited to Friday through Sunday, 9 a.m. to 3 p.m. It features a regular menu as well as weekly specials. The rest of the week (except Monday), Clover Mead runs on the honor system as a self-service farm store from 9 a.m. to 6 p.m.
Young Farmers Take Root in Essex County, N.Y.
WTF: Why Is There a Dry-Docked Ferry at Shelburne Shipyard?